OK, so the actual Royal Opera House is in Covent Garden, but they have to make all their scenery somewhere, and that place is Thurrock. 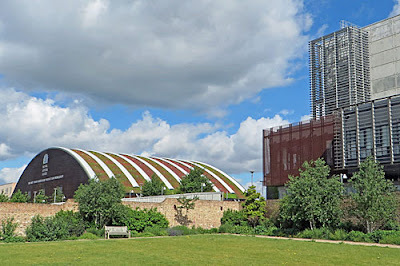 Previously they made it all in a big shed on the Bow Industrial Park, but that had to be demolished for the Olympics, and a more extensive facility has been created at High House Industrial Park in Purfleet. You can't miss it. As the name suggests it's on a hill, or at least the kind of unfloodable mound which passes for a hill round here, close to the point where HS1 ducks under the QE2 bridge. You also can't miss it because it looks like a slice of an enormous beer barrel, its ribbed roof rising above the neighbouring chimneytops with the ROH crest at its shallow peak. Officially the Bob and Tamar Manoukian Production Workshop, this mega-studio and costume store has been built in the grounds of a Queen Anne manor, namely High House, which has been sympathetically restored as part of the new development. This includes the octagonal brick dovecote, one of the largest and finest in southern England, while one outbuilding has become a cafe with a walled garden out back. Rising alongside is a Creative & Cultural Skills' Backstage Centre, a kind of campus for production and rehearsal skills, hence I saw spotted several behind the scenes workers and students milling around the site. It's not clear whether the public are allowed to wander in off the street like I did, even for a coffee, but if you want to explore the interiors properly (and see the latest sets and scenery destined for the Royal Opera House stage) official tours are run on Fridays, and they look really interesting. The last thing I expected in a flat marshy area was tall chalk cliffs, but I should have thought again. The land between the Thames and the A13 rises to a height of over 100 feet, and has been repeatedly carved out over the centuries for mineral extraction. 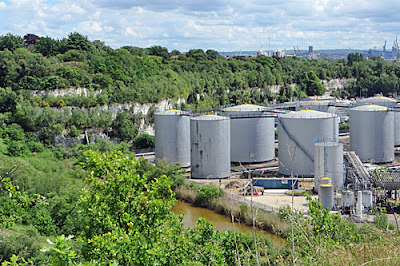 This has left gaping scars in the landscape, mostly deep chalk quarries, hence the network of man-made cliffs that threads across the area between Ockendon and Grays. The largest redundant quarry was Mill Wood Pit, which boasted post-industrial biodiversity of national importance, alas now lost, because in 1989 it was decided to cover the area with housing. 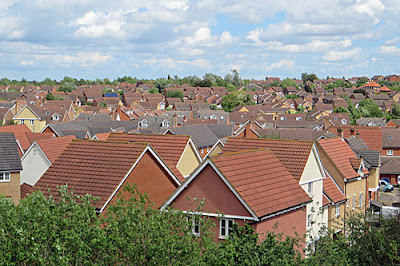 The new estate was called Chafford Hundred, a dense swirl of high-gabled houses, now numbering over 5000 in total and very much the place for the aspiring Essex family or upcoming yuppie to set up home. But suburbia didn't quite fill the entire area so a number of other quarries and pits have been left as nature reserves, a kind of undevelopment zone which all the major roads have to divert around and between. The most important scientifically is Grays Gorge, where chalk extraction ended in the 1920s giving alternative habitats plenty of time to establish. One footpath head around the rim, with the occasional gap to peer over, while another heads down 100 zigzag steps to the 'lower shelf' where wooded scrubland surrounds a central lake, and rare orchids can be found at this time of year if you know where to look. Lion Gorge has a much better name, and sheer drop descents to a linear lake brimming with roddable fish, for those Men of Essex who enjoy a hooked dangle. Wouldham Cliffs create a lofty divide between the upper and lower halves of the estate, the only direct connection being an almost insignificant footpath of breathy steepness. From the top you can look east over Chafford Hundred's tightly-packed rooftops, or south over a cluster of oil silos towards Grays and the distant Thames. I met almost nobody at any of these places, but dozens at Warren Gorge because that's the ex-quarry with a car park and a visitors centre... and I'd say the least interesting of the lot. But if a geological and ecological safari ever appeals, you could do a lot worse than come explore Thurrock's artificial cliffs. Where Thurrock prefers to go for entertainment is a giant shopping complex by the M25. Lakeside opened in 1990 across a former gravel pit and quarry, bringing mall culture to the unsuspecting Essex populace, who duly lapped it up. The main retail cathedral is half a kilometre long, from House of Fraser down to Debenhams, with an even larger outlet park alongside and served by a five-figure number of parking spaces. For many families this is a full day out, circling the shopping levels and pausing for refreshment, be that a McFlurry in hand or a proper sit down meal. The preponderance of "eateries" is striking, with the more expensive chains lined up facing a pedalo lake and fake steamboat along the refreshed Boardwalk. A few years ago the mall was renamed intu Lakeside, an over-chirpy brand whose exhortations to shop and enjoy are plastered everywhere. But they know their target audience well, ambling from fashion outlet to department store with broad smiles and several carrier bags dangling. 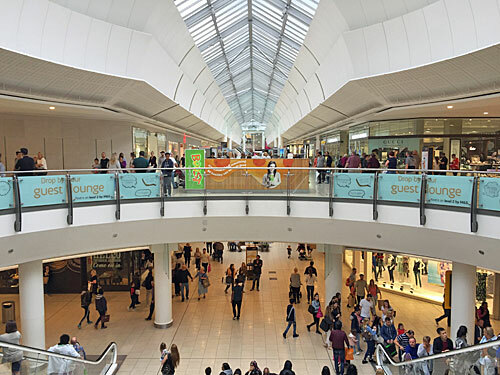 There's a bright airy feel, plus upgraded Italian porcelain flooring to give the place a smarter ambience, but Lakeside is still seen as the downmarket partner of Bluewater across the Thames, as the continued presence of Poundland, Wilko and Spudulike confirms. And still half a million visitors flood in each week, to browse and consume at Thurrock's flagship commercial theme park, and why visit anywhere else?